Porsche is introducing new members to its Macan midsize SUV at a rate that’s hard to keep up with. Late in 2016 it came up with a low-cost 185 kW four-cylinder model retailing for just $80,410. 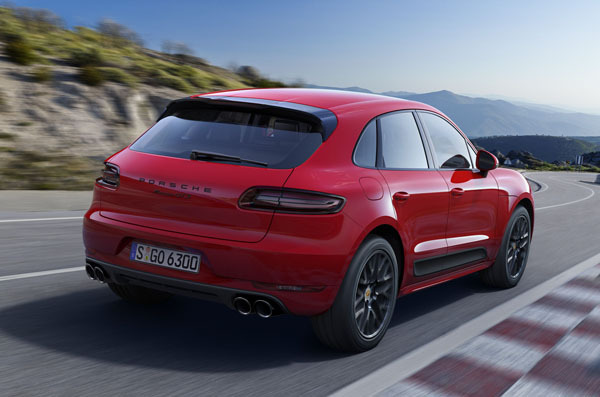 Earlier in the year Porsche had added a Performance Package to the already hot Macan Turbo. With a tag of $133,800 it wasn’t exactly cheap, but having 324 kW under your right foot made it a proposal for those who are cash rich. So, it seemed like a good time to get behind the wheel of a Porsche Macan again. Our request for a Turbo with Performance Package led to a ‘so sorry’ look from the people at Porsche. But they did offer us a week with a midrange, $114,000 Porsche Macan GTS. Launched midway downunder in 2016, the GTS sits between the Macan S and the Macan Turbo. It offers plenty of Porsche performance for a relatively modest outlay. If you’re wondering why this plethora of Porsches is offered it’s because almost half of all Porsches sold in Australia at present are Macans. There’s no doubt that Macan is a Porsche thanks to lines that, while not making it look like a 911 on stilts, do show plenty of homage to that evergreen icon. Our test car was black on black, with more black, relieved only by bright red brake calipers that further enhanced the mean black look. Loved it. The three-dial dash is very Porsche, which is not a bad thing as the sportscar maker has refined it over many years on the 911 range. It’s dominated by a large speedo and tachometer and a third screen with different modes – trip computer, satellite navigation and additional information of the type that often take up additional dials on other marques. A 7.8-inch screen controls everything from smartphones and music through to satellite navigation. It’s easy to set up, though you use controls on the centre console and the steering wheel. With practice it becomes simple enough. The 11-speaker audio system has impressive sound. The Porsche V6 is brilliant, from 3.0 litres beefed up by two turbos it gives you up to 265 kW of power and 500 Nm of torque. Macan GTS sprints to 100 km/h in 5.2 seconds. 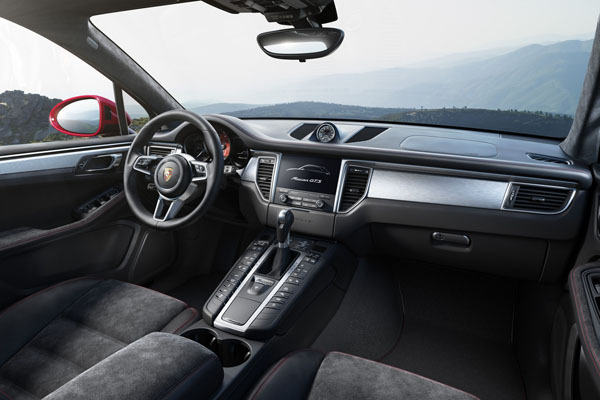 Drive is to all four wheels through the Porsche seven-speed PDK transmission. It comes as no surprise in a Porsche that it is biased to the rear wheels whenever possible. Primary safety, the ability to stay of of trouble, is excellent. It has stability and traction controls ABS, EBS and brake force distribution to assist drivers who get seriously over confident. There is no ANCAP safety for Porsche Macan, which doesn’t exactly make it unique in this sporting class. There are eight airbags. The front seats are reasonably spacious, with Alcantara that’s soft and smooth. You sit low in the Macan, not quite Boxster or 911 low, but there really is a feeling you’re in a sports machine not an SUV. The back seats are relatively restricted in space due to the sloping roof. A victory of fashion over function? Perhaps, but we have no trouble with that in Macan. But make sure that hulking teenage kids are included in your crew for your pre-purchase test drive. With Porsche’s active ride system in Comfort mode, urban ride quality is fine. It gives you a firm but compliant feel to let you know this is a sporting SUV, not an off-road basher. Switch everything up to Sport and the Macan’s character changes significantly. The engine growls nicely and the automatic shifts are beautifully quick, yet, cleverly, they remain almost imperceptible. BTW you want the performance sound but not the performance, such as when pottering about town, one of the buttons on the console will provide it for you. The twin-turbo V6 is happy to reach its redline in a most enthusiastic manner and makes all the right noises while you’re getting all the way up there. Macan is great fun when you take it to your favourite stretches of fast corners and little traffic. There’s a little understeer that can be controlled easily by the throttle. And when you exit the corner there’s a real slingshot feel as you head for the next group of bends. 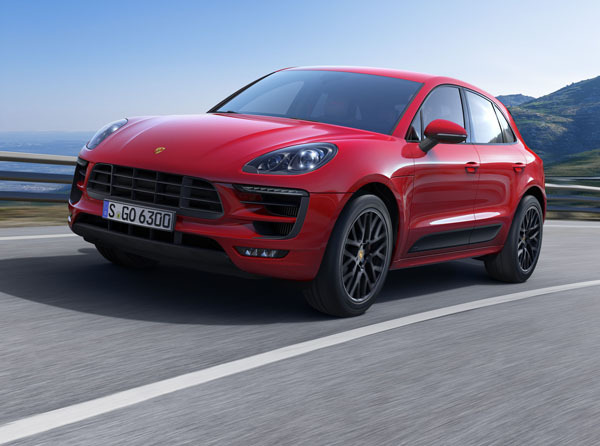 With models ranging in price from $80,410 to $133,800 Porsche Macan has something for everyone. The Macan GTS we tested provides an excellent compromise between budget and blastoff. Note: These prices do not include government or dealer delivery charges. Contact your local Porsche dealer for drive-away prices.